[Edited later: If you can’t tell by the relatively high number of comments on this post, I got featured in the Freshly Pressed section of the WordPress homepage and I’m rather proud to say I received about 7,000 hits over about two days. One of the great parts about that was all the feedback I got about this post, including one comment from Robin Esrock from Word Travels, who promoted my post on his Facebook page and Twitter. Check out his comment below, where he says travel writing isn’t always the dream job people think it is, and you’ll also find a link to his site. If I were to rank the best jobs in the world, it would probably go something like this: Ian Somerhalder’s personal masseuse, roller coaster tester and then travel writer (or TV host). But until I can make all, or any one, of these a reality, I will have to be satisfied with reruns of The Vampire Diaries, trips to amusement parks and watching luckier bastards than me travel the world for the living. And in the meantime, I’ll watch my three favourite travel shows for pointers while I boil with envy. 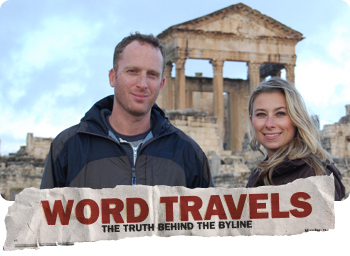 This is a Canadian show that follows two travel writers as they, well, travel and write. It’s an interesting take on the traditional travel show, as it’s just as much about their personal experiences looking for stories and piecing together columns and articles as it is about the places they visit. Plus, having one writer – Robin – focus on the extreme side of traveling (like snowboarding down sand dunes in Dubai) and having another – Julia – write about the quirky, cultural side of travel (like training to be a gladiator in Rome) makes for a great diversity of content. I also like reading about how the hosts of travel shows got those jobs. Robin, who’s based in Vancouver, used to work in music and marketing, but after being struck down by a car while on his bike he got a sweet $20,000 settlement and decided to run off and travel the world for a year. He wrote a column and a travel blog about it, and the rest is history. Julia, meanwhile, started her career writing a movie column for the Toronto Star at the age of 12 (yes, 12!) and after six years transitioned to travel writing. Someone needs to explain to me how she managed to get that gig. The show’s website doesn’t fully explain how the guys managed to secure this gig, but Scott has a film background (he met the camera dude Andre while in film school) and when they came up with the idea for Departures, he called up his old high school friend Justin and a show was born! This American show highlights one of the best – if not the best – parts of traveling: food. Not only is food one of the foremost expressions of a culture, but it’s also something everyone can enjoy and it differs in very interesting and revealing ways from one place to another. The great part about this particular show is that Anthony brings an enormously likable persona and infectious love for food to every dish and beachside tavern. He’s also a bit grumpy and has a bit of disdain for vegetarians, but that’s all part of the charm. His knowledge of food and international travel makes him a hugely entertaining guide. 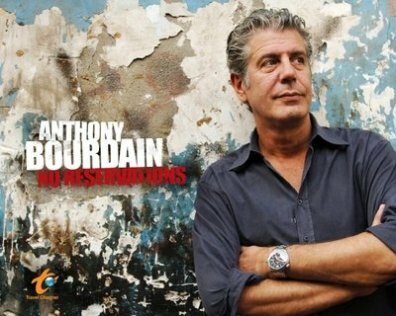 Anthony has a culinary background and jump started his life as a famous writer and television personality by writing about his life working in restaurants “good, bad and horrible” in his book Kitchen Confidential. He later combined travel and food in A Cook’s Tour and now he has his own awesome show. Speaking of travelling, I really enjoy to see country side by train from Frankfurt to Munchen/Munich particularly during October fest. Drink beer the whole day and enjoy the friendly crowd. Vienna also very interesting to visit Grindzing with typical Austrian restaurants and by surprised we were entertained by house music with Indonesian song. Going to Frisco with Saisalito it’s fantastic and created feeling you’re in peaceful garden on earth. But now I quit travelling due to so much secutiry formalities nearly in every airports which made me feel uneasy. Ha, yeah, if the travel discussion does not get to the food, it does little for me. Hi there, I love watching travel programs as well, particularly the ones that deal with the food in different countries. Pursue your dreams – the sky is the limit. To give you an idea, a friend of mine kept a very entertaining blog whilst working in the UK and travelling abroad, which upon his return home to South Africa, landed him a job as a travel writer. Sweet list! I love watching No Reservations and am a big Bourdain fan. Interesting to read about travel programmes from another country! I have often wondered how the presenters got their jobs – that could be a whole TV series. You have literally spoken my mind. I burn with evny whenever I see these people get paid for what they do and I always feel I can do a much better job for them for free!!! These look amazing – I would love to have those jobs too! Recently my sister has been watching Man Vs. Wild, with Bear Grylls, and she drags me into it sometimes if I’m over there with nothing to do. As far as I can tell, it’s this adventuresome guy who gets dropped off in the middle of the wilderness (glaciers, deserts, rainforests) and has to make his way out. The internet says he was the youngest Brit to climb Mt. Everest, so he’s got respect in my book. I would love his job too, EXCEPT the eating-whatever-you-find bit. In the Sahara, that turned out to be grubs. *shudder* I think he’s on the NatGeo channel, but I’m not sure – my sis is always the one with the remote! He ate bear poop once as well. Made a great show of how all the nuts and berries were still intact within the feces, just waiting for him to come along. Strong stomach! I’d love to travel for a living… Samantha Brown has the best job! Nice post I enjoyed it. I’ll have to check departures out. And yeah, these are some lucky (though hard working) folks. Think I need to get those pretty boys to come visit me 🙂 I’m off the beaten track. What a dream job. I’ve really dreamed about doing it for a long time! Oh well, guess I’m not the only one! Interesting stuff. I absolutely love Anthony Bourdain. I’d let him talk me into eating anything as long as he’d have a beer with me. I’ll be joining them later this year as I take off on my year around the world. They have all been excellent trailblazers. As a travel writer/television producer, let me tell you that it isn’t all roses. Working on the road is really tough — it’s about the furthest thing from a vacation that you can imagine. Especially TV production. That said, it beats life in a cubicle! I really like this post good job! I’d love to travel for a living. Samantha Brown = lucky! My, but that’s a pretty name. Yes, well, about the travel shows: I’ve always found them similar to makeover programs, interior design shows, and the cooking channel — they strike me as faintly disguised sales catalogues. There’s always a very attractive person, modestly yet somehow sexily attired, divulging bits of information about the locale which display a remarkable range of relevance and various capacities to garner one’s interest. There’s usually music playing low in the background, usually something one tends to hear in a store catering to young girls at the mall. Your point, Miss, remains unscathed, of course. I wouldn’t mind seeing the world for free, either, but if anyone ever sticks a microphone at me and makes me say insipid nonsense like some babbling auctioneer’s hand puppet, they’re going to get a piece of technology in a compromising spot to be sure. I’d backpack through Spain on a student’s budget and wash dishes from time to time any day, rather than predicate a worldly career on my best Martha Stewart impression. You write very well, Miss. It’s a delight to visit here. Thanks for providing us with your warm and optimistic perspectives. I love Samantha Brown and Bourdain! Well, check out IndieWomanMag on here y’all! I’m a writer, traveler, and do-gooder with my partner in crime Beth who is a filmmaker and documents it all. We just shot in New Orleans as the spill was unraveling. The video will post on our website soon. Join us and let’s support our community of bloggers and adventure seekers! Ah, to be a travel writer, can you imagine a better job? OH OH here’s one: those Conde Naste travel writers who get sent to the best spas in the world, to review. Oh my stars. And being a food reviewer columnist is a close runner-up. Oh, sooooo jealous. I want to travel more! I love the Susan Sontag quote you have at the top of your page. Anthony Bourdain is the man. He eats just about anything. Haven’t seen the other two shows but Departures looks pretty sweet. No Reservations is on my regularly watched list. I haven’t heard of the others – I must find out if they’re available down here. Travel is fun – but not for work! I’m off to Egypt tomorrow. I wish I could spend my weekend at home. Nice post. These travel shows look good. I spent a year in Italy and travelled to 50 European cities. We spent a week with British cousins at a villa in the South of France, took an overnight train across Poland to visit my husband’s relatives in Gdansk, spent a weekend in the resort in Wales where the 60s tv show “The Prisoner” was filmed. My favorite memory of that year was hearing the wheels of our small rolling suitcases as we took off for another adventure. Living there – leaving and coming home to a country other than your own – adds a deeper dimension to travelling. Living in another language makes the most mundane experiences – buying groceries, taking a bus, setting up a bank account – a fascinating challenge, but maybe that was because I lived in Italy, where culture meets chaos over cappucinno. I loved writing about it all – at 4initalia. A year of travel can happen for you – but you have to make it happen. Dream, plan, and go for it. Seriously?!?! Is that job for Ian Somerhalder’s personal masseuse still open? I really could do that job… I would LOVE IT! AWESOME to find another Vampire Diaries fan! My friends HATE it and I LOVE IT!!! Thanks for the post!!! No Reservations is a great show. Anthony has a great personality for visiting different countries. He often gets into interesting cultural situations I find quite amusing. Seems like he can usually drink his way out of any language barrier, great skill to have. I love Anthony Bourdain!! He’s so raw and talks to people like their adults and not like he’s trying to sell you something. I wish they wouldn’t censor him. It would add another dimension to his reality. He didn’t have very many new episodes this year though…did he? I traveled a lot to asia and Europe in my 20s. Now that I’m home with a wife and kid in my 30s I envy folks that travel even to another state. I guess at least I have my past to reflect on. Im already your fan, your flickr photos are BEAUTIFUL !! this is great, way to go! There’s a book entitled “N Places to See Before You Die” (sorry I forgot how many places). I think that is cool if you can visit even a little percent out of it the number. I’m so broke it’s hardly worth keeping the fridge on – seriously thinking about starting a website called Hobo Holidays – a bedroll, ten bucks in my pocket, and a quart of Thunderbird! Five-star park benches and hitch-hike friendly turnpikes! What about that show Three Sheets? Those guys who go around drinking in random places, recently were in Croatia and seemed to have a great time! LOL. I would LOVE to be Ian Somerhalder’s personal masseuse. 😛 And I love Anthony Bourdain. He has THEE best job in the world. Thanks for the post Zalina, we’re honored that Word Travels topped your list! 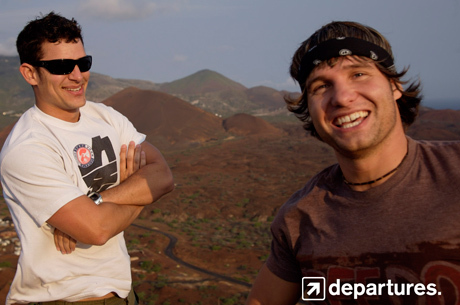 I often find myself wondering how I landed the “dream job” hosting a travel TV show, but as Doug noted above, it’s far from a holiday. Jetlag, crazy schedules, deadlines – when being on the move becomes a job, the dynamics tend to shift. That being said, we filmed in 36 countries on 6 continents, and I got to do everything I’ve ever dreamed of doing, sometimes twice! So definitely no complaints. If anyone wants to find out how I became a travel writer and a TV host, they’re welcome to check out my blog – http://www.moderngonzo.com. There’s stories, pictures, video and tons more from the 90+ countries I’ve visited. And you can watch Word Travels on National Geographic, and soon Travel Channel International worldwide too. Reblogged this on it’s an amazing world.